If you belong to the league of groundbreaking business people, welcome to our team! At Bonusthemes we are constantly researching the new opportunities that emerge in e-business, offering ready-to-use solutions before you even ask for them. That is the philosophy behind cloudhost. It is a state of the art template created especially for those who are now venturing into cloud hosting, or have already done so, offering web hosting as well as data storage, file transfer, file sharing services etc. With a clean-cut technological design that avoids the pointless graphics bravura, cloudhost is the ultimate digital display window for the advanced services provided by your business. Encouraging you to adopt an aggressive marketing strategy, the slide banner dominates the home page, allowing for alternating messages, graphics and designs to appear on screen. The structure of the main menu is fully customizable, while the 4 frames occupying the centre are there to instantly direct you to service analysis, subcategories, customer service policies, technical standards etc. Cloudhost supports the K2 content management system, though many of you might opt for the tried-and-true e-commerce solution of virtuemart. 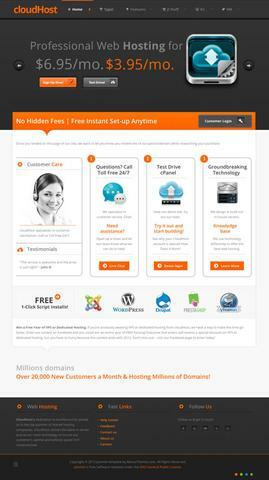 Cloudhost comes in 4 different color skins –orange being the most prominent– so as to satisfy all possible tastes. Moreover, additional skins and other services will become available to Bonusthemes subscribers along with future updates. Discover all the possibilities and technologies incorporated in cloudhost by using the live preview browser! Naturally, like all Bonusthemes templates, cloudhost could be used in any other project! Your imagination is the limit!